Adjacent to the National Parliament in Waigani is portion 1564 – a 12.13 ha plot of land with premiere views of the city. During 1989 a state lease over portion 1564 was awarded to Macata Enterprises, a company headed by the then national MP, Tom Amaiu. Amaiu had been released several years earlier from prison after being convicted for theft. Despite a lack of development on the site, the state lease has remained with Macata Enterprises for over 25 years – it is due to expire in 2094. 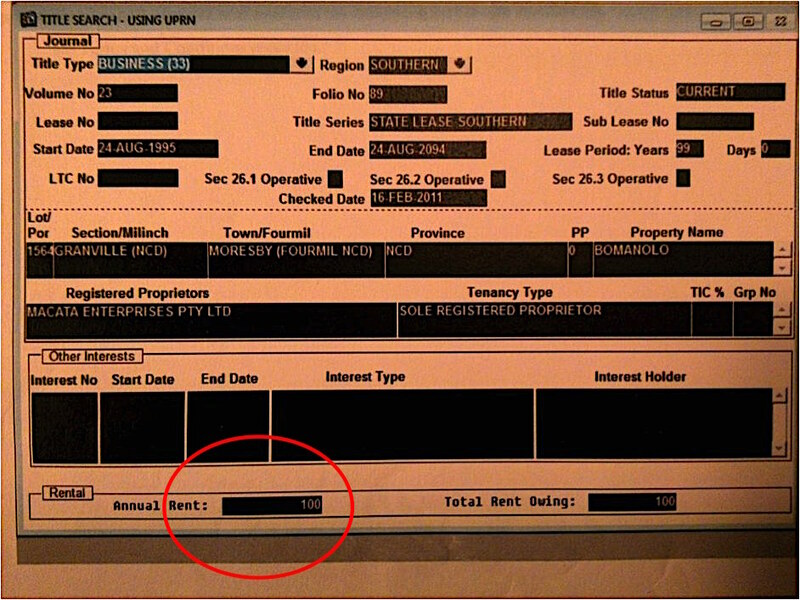 According to Lands Department records viewed by PNGi, Macata has been paying annual rent of K100. 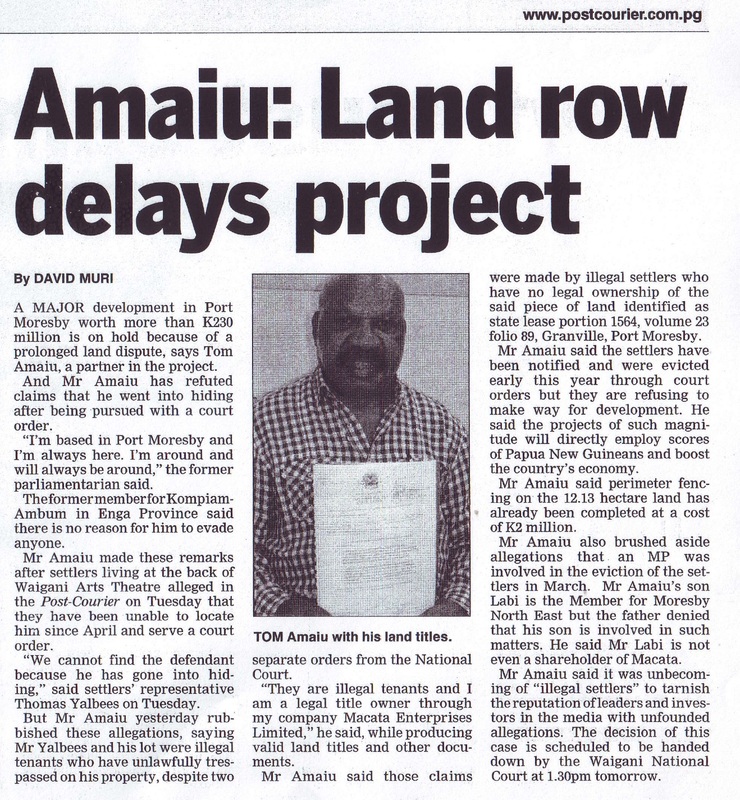 Image: Amaiu hit national headlines in 2013 when he clashed with Arts Centre Settlement residents. However, after quarter of a century Macata Enterprises has finally turned this prime property into a financial bonanza for its shareholders. According to court documents Macata has been paid a ‘substantial’ access fee by China Railway Construction Engineering Group (PNG) Real Estate Limited in order to initiate a luxury apartment development on the land. This lucrative deal has triggered a wave of destruction and recriminations. Armed police and private security, demolished settlement homes on portion 1564 to make way for the luxury estate. Meanwhile, Tom Amaiu and his wife Cathy Amaiu, traded blows in court as each tried to acquire the lion share of the ‘access fee’ paid by Chinese investors. A former Macata shareholder is the Amaiu’s son, prominent political figure Labi Amaiu. 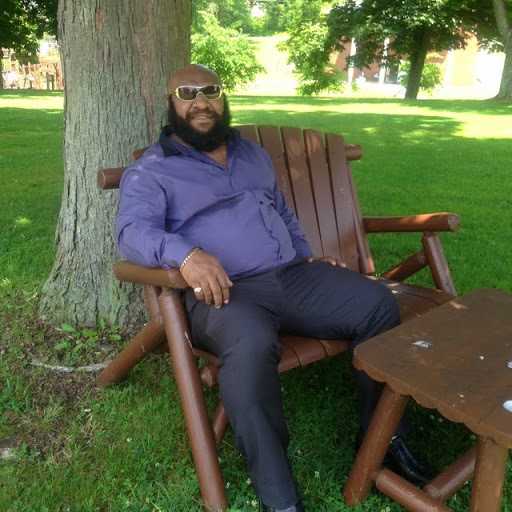 Labi is currently trying to reclaim the seat of Moresby North East in the National Court – portion 1564 is situated within the Moresby North East electorate – which he lost to John Kaupa in the 2017 elections. He has denied any links to Macata. 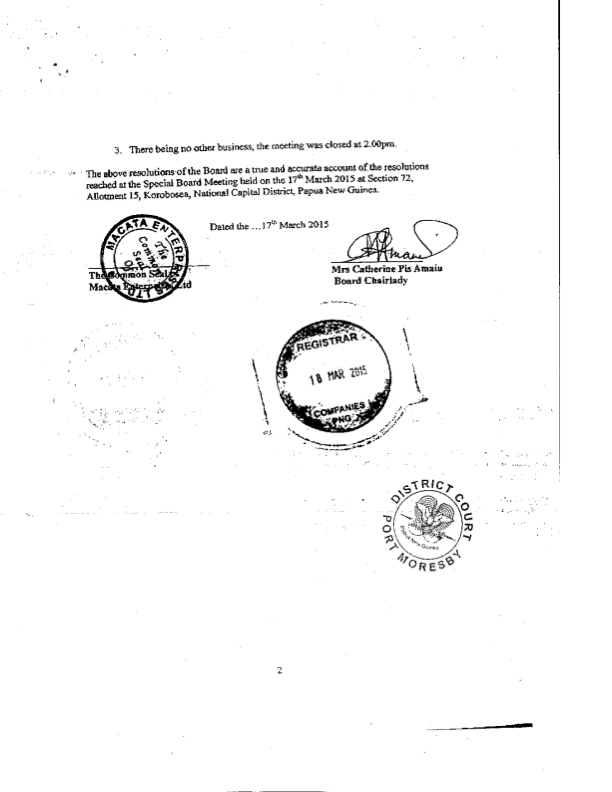 Image: When MP for Moresby North East, Labi Amaiu denied ties to the family business. 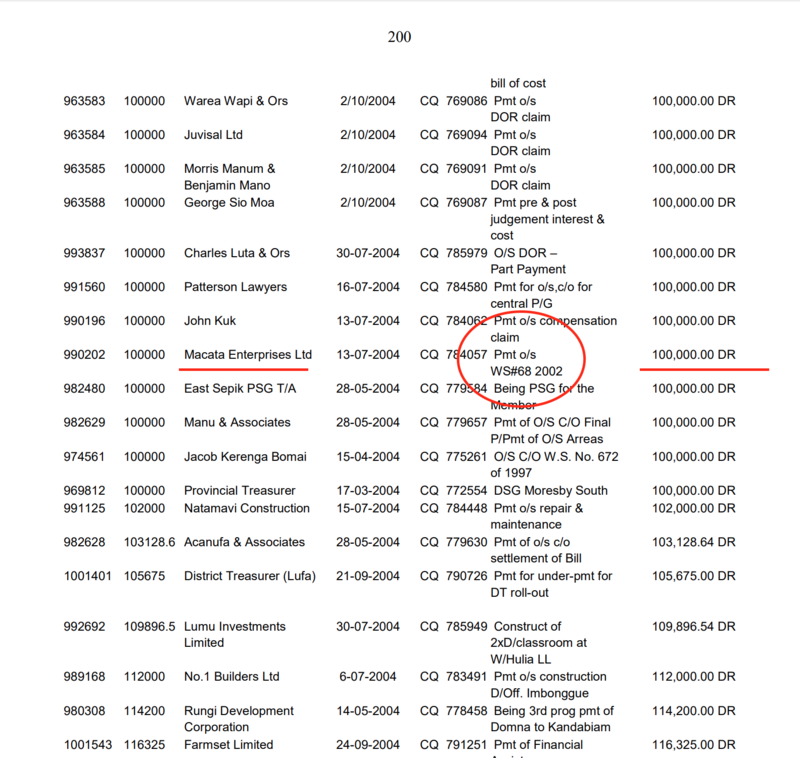 Portion 1564 is no unique scandal, across the city and country, prime state land is being leased at fire-sale prices, to companies with significant political clout and connections, allowing recipients to make millions at the expense of the PNG public. This PNGi investigation is into one state lease fiasco, there are hundreds of others out there. 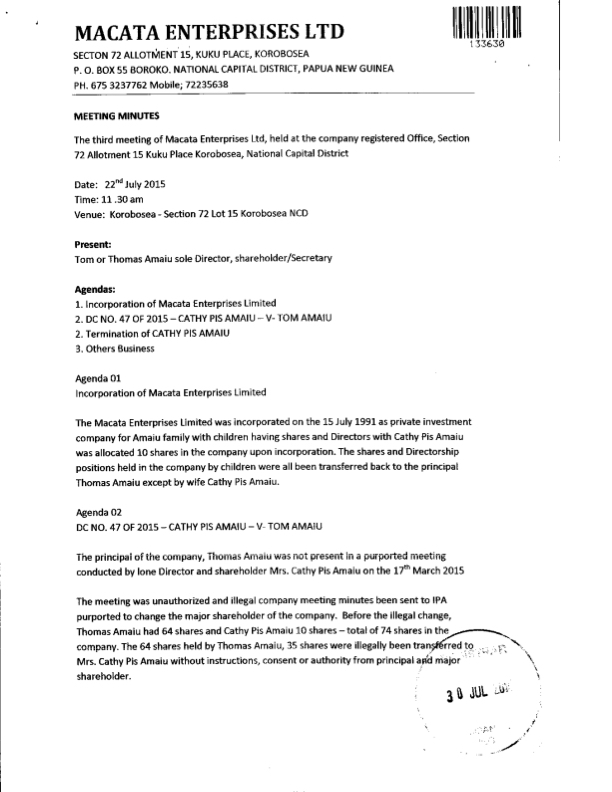 At the epicentre of this scandal is Macata’s Managing Director, Tom Amaiu. Over the past forty years Amaiu has earnt a colourful reputation. Amaiu’s first steps into public life took place during the late 1970s, when he was elected Member of Parliament (MP) for Kompiam-Ambum, an electorate situated in Enga Province. Amaiu’s tenure, however, was cut short by a theft conviction in 1979. He was sentenced to five years imprisonment with hard labour. Following his release from custody, Amaiu was re-elected to Parliament and served, somewhat ironically, as Minister for Prisons. According to Transparency International, Amaiu then resigned from parliament in 1992, after a Leadership Tribunal was appointed to investigate allegations of public misappropriation. During his political career, Amaiu is reported to have been heavily involved in the alluvial mining industry at Mt Kare, where he ‘did well as a gold buyer’. According to Australian journalist Rowan Callick Tom Amaiu’s success was such that he ‘acquired special status as a high roller at Queensland’s casinos [in Australia]’. 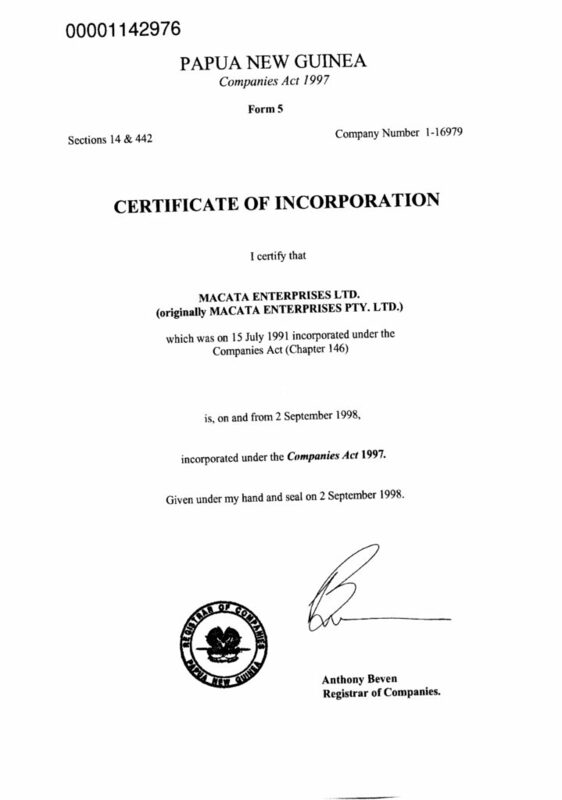 It was during this period of commercial success, that Macata Enterprises was incorporated on 15 July 1991. Annual returns list the company’s principal activity as ‘management agency’. Unusually, Macata’s assets, liabilities and employees have remained notably static since 2000. They are consistently declared to be K100,000, K10,000 and 10 respectively. We also know from National Court records that Macata Enterprises has been involved in the gambling industry. According to Justice Hartshorn, police seized 180 gaming machines owned by Macata, after it was revealed that the company did not have a licence under the Gaming Machine Act 1993 (Macata Enterprises Ltd v Independent State of Papua New Guinea  PGNC 278). The National Court rejected Macata Enterprises’ request for compensation, awarding costs to the state. Nevertheless, Public Accounts Committee reporting indicates that Macata was paid K100,000 out of Trust Fund Suspend Account No.2. Image: Public Accounts Committee report scrutinises Trust Fund Suspend Account No.2. The transfer reference notes the payment was for ‘WS 68 2002’, which corresponds to the National Court case number where Macata’s request for compensation had in fact been dismissed. This fact needs to be read alongside other concerns raised by the Public Accounts Committee. In particular, the committee observes, ‘this [Trust] Account was used as a conduit for misappropriated and illegally applied monies [which were] at the complete discretion of unelected and unrepresentative officers of the Department of Finance’. A subsequent Commission of Inquiry similarly discovered, ‘funds to process settlement payments of claims against the State on numerous instances were illegally sourced from other appropriation such as the Trust Fund Suspense Account No. 2’. Unfortunately, neither inquiry specifically commented on whether the payment to Macata Enterprises was illegal – therefore, it cannot be established whether this payment was improperly made. In addition to Macata Enterprises, Tom Amaiu has owned or managed 35 companies, some of which are tied to Ministers, public officials and international business people from Malaysia, China, and Australia, including former Attorney General, Francis Damem, former Lands Minister, Sir Albert Kipalan, and the controversial Icelandic-Australian business identity, Gudmundur Fridriksson. 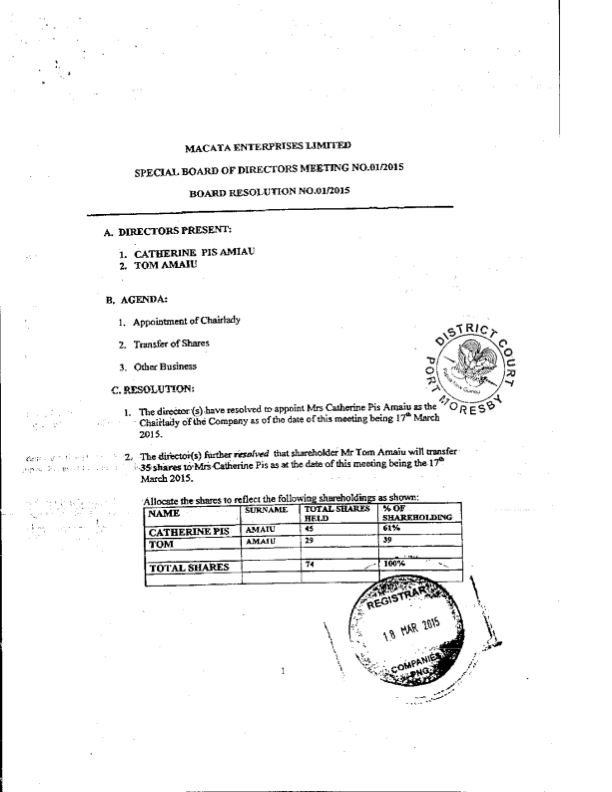 Macata’s leasehold title over portion 1564, it appears was initially awarded in 1989 by Land Board Meeting No. 1773. This decision appears incompatible with the company registry maintained by the Investment Promotion Authority, which suggests Macata Enterprises Pty Ltd did not become an incorporated legal entity until 1991. It is not clear how a prime piece of land in the capital’s political district could be awarded by the Land Board to a company owned by a MP, which was apparently not legally registered. A gazettal notice dated 24 August 1995 states that Macata Enterprises’ Town Subdivision Lease was renewed by Land Board Meeting No.1940. 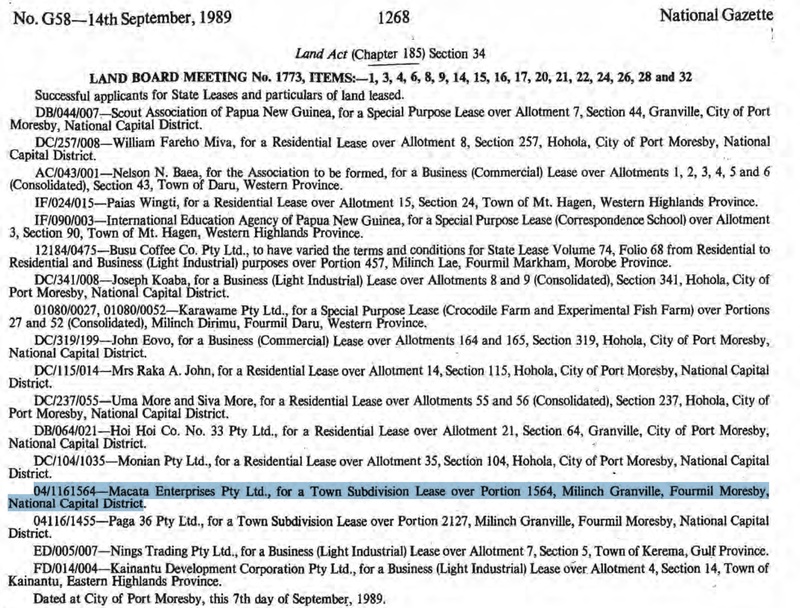 This notice contrasts with Lands Department records (see below) which indicate Macata in fact holds a 99 year business lease issued on 24 August 1995. The reason for these discrepancies is not clear. During this period the Land Board was presided over by Sir Ralph Guise, an individual who later met disgrace for his involvement in a range of illegal activities as Chair, including bribery and fraud. The Lands Minister at the time was Sir Albert Kipalan. Kipalan would subsequently become Tom Amaiu’s business partner, through the jointly owned company Bless Corporation. This raises potential conflict of interest concerns, if there was any personal relationship between Amaiu and the Lands Minister at the time this award was made. Lands Department records suggest annual rent for portion 1564 was set at just K100. Land Regulation 1999, states rent on a business lease should be levelled at 5% of the unimproved land value, unless a special Ministerial dispensation has been applied for, and approved, under section 83 of the Land Act 1996. It is unknown whether such a dispensation has been granted. Between 1995 and 2011, when Macata Enterprises appears to have held portion 1564 at a nominal rent, property prices throughout Port Moresby increased significantly, with Waigani, Paga Hill and Ela Beach being among the principal beneficiaries of upward price shifts. Image: Screenshot of Lands Department LAGIS record for Portion 1564. Macata Enterprises claimed during 2013 it successfully negotiated a K300 million investment, which will transform the vacant land into a luxury estate, featuring a hotel and apartments. Company records show that a development agreement has indeed been signed with China Railway Construction Engineering Group (PNG) Real Estate Limited. One major barrier preventing the agreement’s implementation, was the 4000 people resident on portion 1564. Following a series of court battles and home demolitions, Macata Enterprises succeeded in evicting the residents, paving the way for the new development. Facing a major payday, Macata’s husband and wife team, fought each other for the spoils. By this stage of Macata’s corporate life, Tom Amaiu had increased his holdings to 64 shares, through a transfer from his wife. This left Cathy Amaiu with 10 shares. 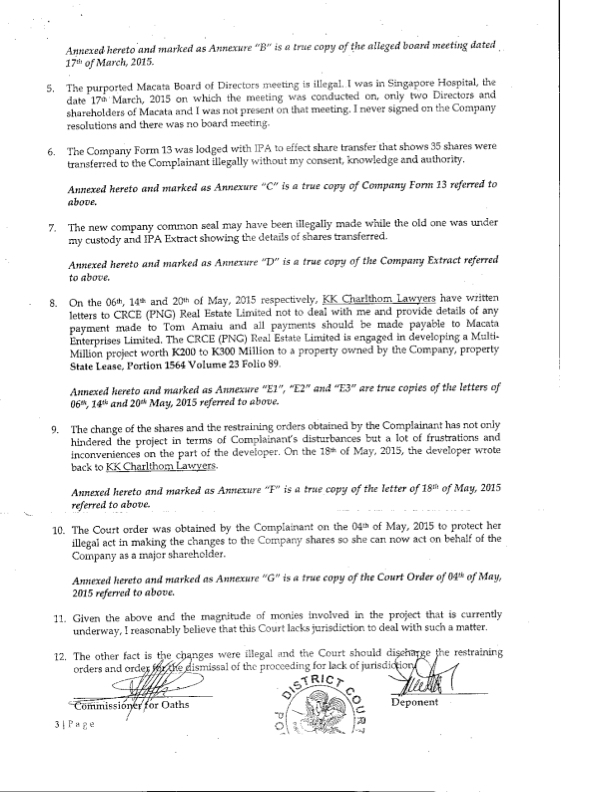 However, on 17 March 2015, a special Board of Directors meeting resolved to transfer 35 of Tom Amaiu’s shares, back to his wife. This gave Cathy Amaiu a 61% controlling stake in the firm. 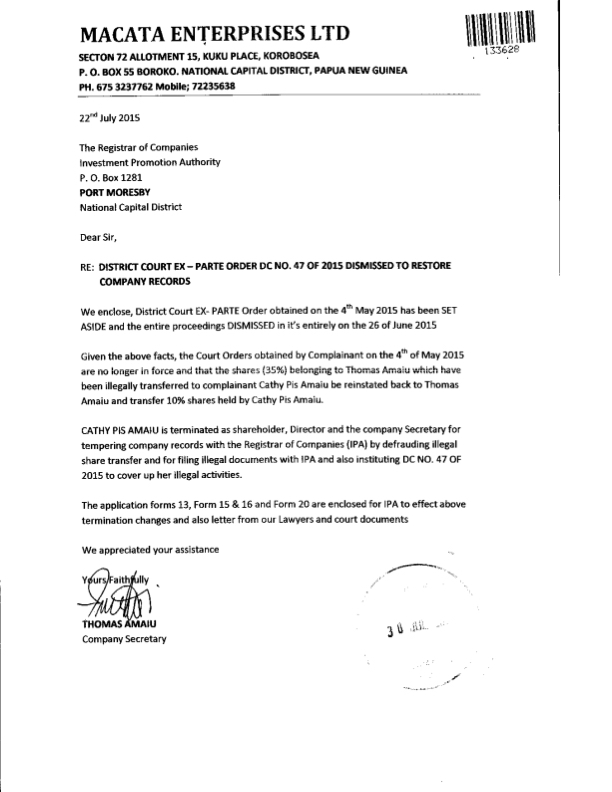 Just over a month later, on 4 May 2015, she obtained a restraining order preventing Macata Enterprises from conducting any business, or enacting change to its corporate structure. 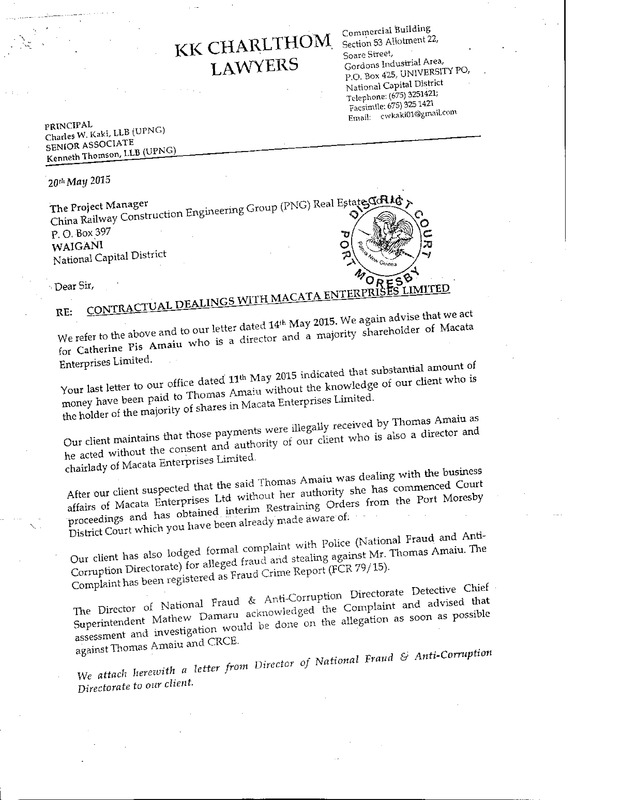 Our client maintains that those payments were illegally received by Thomas Amaiu as he acted without the consent and authority of our client who is also a director and chairlady of Macata Enterprises Limited … Our client has also lodged [a] formal complaint with Police (National Fraud and Anti-Corruption Directorate) for alleged fraud and stealing against Mr Thomas Amaiu. The complaint has been registered as [a] Fraud Crime Report (FCR 79/15). The purported Macata Board of Directors meeting was illegal. I was in Singapore Hospital, the date 17th March, 2015 on which the meeting was conducted on, [there are] only two Directors and shareholders of Macata and I was not present on that meeting. I never signed on the Company resolutions and there was no board meeting. Tom Amaiu thus maintaned that ‘the company Form 13 was lodged with [the] IPA to effect [a] share transfer … illegally without my consent, knowledge and authority’. In June 2015, the District Court set aside the restraining order awarded to Cathy Amaiu. It was stated in the decision that the originating court lacked jurisdiction over the matter owing to the sizable amounts of money involved (Catherine Pis Amaiu v Tom Amaiu, Alex Tongayu, and the Investment Promotion Authority, DC No.47 of 2015). Following this decision, Tom Amaiu unilaterally dismissed his wife as Company Secretary, Director and shareholder. He informed the Investment Promotion Authority: ‘Cathy Pis Amaiu is terminated as shareholder, Director and the company Secretary for tempering [sic] company records with the Registrar of Companies (IPA) by defrauding illegal share transfer and for filing illegal documents with IPA and also instituting DC No. 47 of 2015 to cover up her illegal activities’. 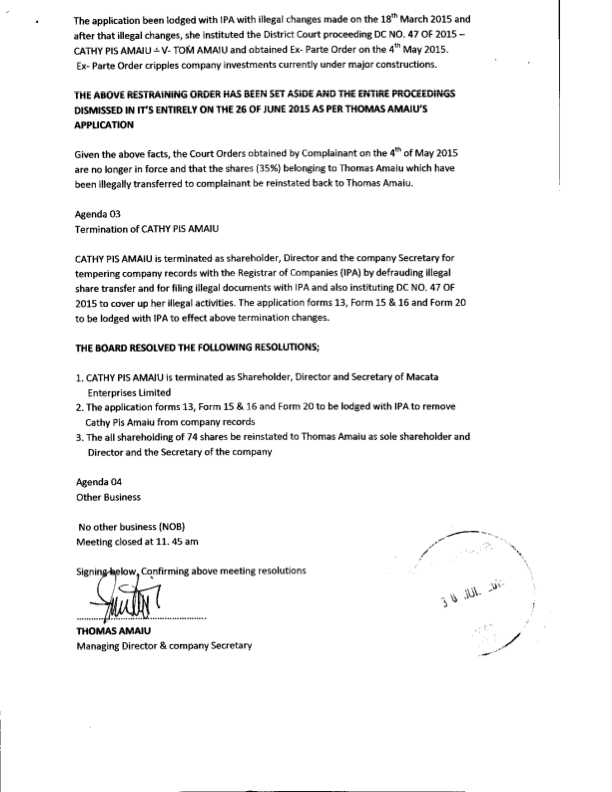 According to company minutes, this decision to terminate Cathy Amaiu’s involvement and stake in Macata Enterprises was made at a meeting held on 22 July 2015. The 15 minute meeting involved one individual, Tom Amaiu. Company records also show that the IPA subsequently enacted this meeting outcome, despite having no lawful mandate to do so. Image: Meeting Minutes, Macata Enterprises, 22 July 2015. Under section 67 of the Company Act 1997, a form of transfer signed by the current share owner must be submitted to the company before a share transfer can take place. Given the unilateral character of Tom Amaiu’s actions, which is apparent in the records submitted to the IPA, it should have been realised that this procedure had not been observed. Furthermore, under section 71 of the Company Act 1997, only the Courts have the power to issue an order rectifying a share registry, where shares are alleged to have been wrongfully transferred. The June 2015, Court Order, contains no such direction. Accordingly, it would seem on the basis of the records submitted by Macata Enterprises, that the Investment Promotion Authority has implemented a decision incongruent with Company Act 1997 requirements. 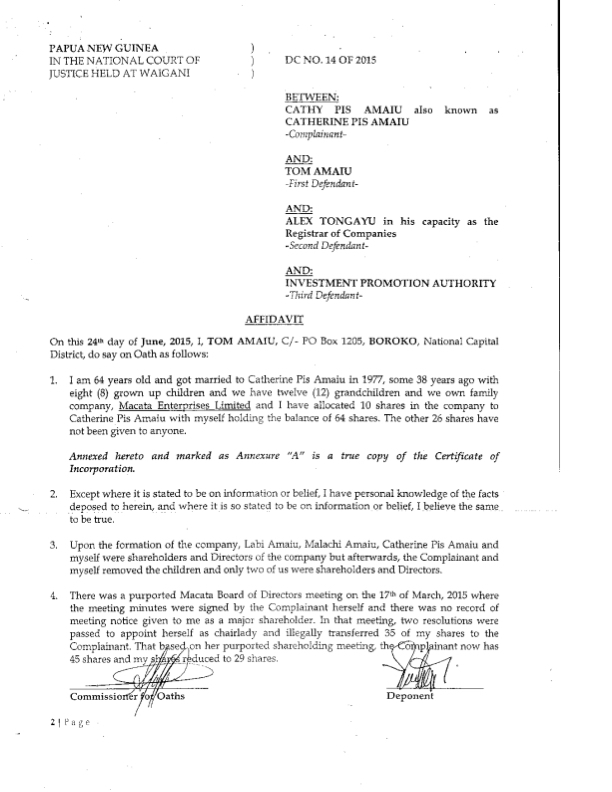 Cathy Amaiu, it appears, has not sort legal redress over her removal from Macata Enterprises. As a result, Tom Amaiu is seemingly in prime position to realise the substantial sums being paid by Chinese investors for access to the Waigani land, which Macata has held at an annual rent of K100 according to Lands Department records. When the Waigani land became the subject of national controversy during 2013, Tom Amaiu’s son, Labi Amaiu, was Member of Parliament for Moresby North East. The electorate includes the Waigani land and Arts Centre Settlement. In 2013 residents alleged that Labi Amaiu was present at one of the eviction exercises, and that they had ‘received death threats from the member of Port Moresby North-East’. Labi Amaiu, EMTV claims, stated ‘he has no ties’ with Macata Enterprises. Records viewed by PNGi suggests this is not strictly accurate (see below). While there is no evidence on the public record to suggest that Labi Amaiu is a formal shareholder in the company, his father claims Labi was initially a shareholder/director in Macata. In addition to this, Tom Amaiu continues to describe Macata Enterprises as a ‘family company’ – although Amaiu Snr does not elaborate on what he means by this. 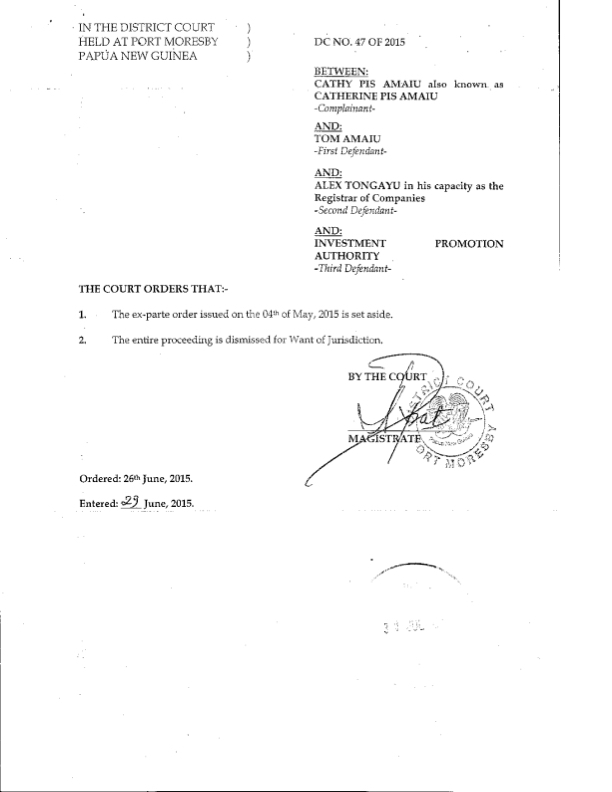 Image: Affidavit, Tom Amaiu, 24 June 2015. The story of Macata Enterprises and portion 1564, echoes many others, which have been presented here on PNGi, or on other media platforms. Leases are issued under irregular or controversial conditions, for a price far below the market rate, to well-connected individuals, often in business with Ministers and other senior government officials. With a sever under-supply of land in urban centres, state-leases are more precious than diamonds. Yet in the face of a moribund Department of Lands, state lease holders frequently sit on state leases for years, even decades. Prime land sits vacant. And then when the market hits its peak, they pounce, often realising profits that would make fast-money scheme promoters blush. Commissions of inquiries, and public audits, have lamented the situation, time and time again. Very little has been done in response. The new Lands Minister, Justin Tkatchenko, has promised to clean up the lands administration. If he is successful, this would be to the significant detriment of speculators, many of whom are in government, and to the distinct advantage of genuine business people who want to grow productive enterprises. Rarely does the real economy in PNG win out over the ‘funny money’ economy. The story of lands administration bears this out. Minister Tkatchenko, if genuine, faces an uphill battle, given Cabinet holds numerous individuals in the thick of the speculative market in state land.